Summer is officially here, which means for me: It’s swimsuit season!!! 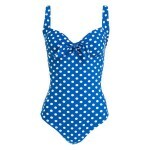 Especially ‘cause we are going on vacation and yes, Clara and I are wearing matching swimsuits of course! Hihi!!! I got myself this really cute one with a palm tree print on it and another gingham one (couldn’t find it online though). I think you can’t go wrong with a ruffled swimsuit, that’s why I found this yellow (be quick! – it’s on sale for under 7€) and this green one for you. Colorful swimsuits always look cute, so I chose this pink sporty one and this red elegant swimsuit. 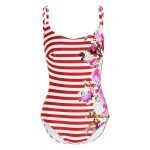 And in case you’re up for some cute patterns please look at this 50s inspired polka-dot swimsuit, this beautiful floral one or this striped one with flowers (such a cute pattern mix). Make sure you stay tuned since there will be a lot of cute Spanish posts!